I think the ones that are most important and impactful are the over-levered consumer, the impending commercial real estate problems and the inability of companies to cut more costs to boost the bottom line. With these substantial headwinds in mind you would assume that at some point the valuation of the market will reflect rational expectations regarding earnings. As such, I would not be surprised at all if the market eventually corrects rather dramatically. As a value investor I sure hope it overshoots so I can get in at a valuation that I am comfortable at. The U.S. stock market bottomed and the U.S. Dollar Index peaked almost simultaneously in March. While U.S. stocks are up more than 50% in that time, the Dollar Index (which measures the greenback's value against the euro, the yen, the British pound, the Canadian dollar, the Swedish kroner and the Swiss franc) is down nearly 12%. With inflation not currently being a problem, it is easy to forget that the real return on an investment also has to include currency fluctuations. In this case the dollars you can sell your appreciated stocks for are worth 12% less than they were in March. While obviously investors holding cash have suffered the same decline in dollar value, investors who put money in foreign equities have been able to realize currency gains and impressive stock market appreciation. The moral of the story? Since March 9, the value of U.S. equities, as measured by the Wilshire 5000, has increased 54%, or $4.4 trillion. But those dollars have been devalued by nearly 12% in that time. Investors should not mistake asset inflation for real wealth appreciation. And policy-makers should not mistake yet another asset bubble as reason to believe their actions achieved their intended goal. Consider this week's projections of growth of gross domestic product in real terms, exclusive of inflation. The White House projects that GDP will grow by 3.8% in 2011 and climb above 4% a year for the next three years, followed by two years above 3%. This is far higher than historical norms-the economy has not seen such a period of growth since the 1960s. This is self-serving optimism. By assuming higher economic growth, the forecasters can show more tax revenue and lower estimates of future deficits. Excessive Obama optimism is not limited to economic growth. Despite the enormous monetary stimulus pumped out by the Federal Reserve in 2008-2009, bank credit that is widely regarded as potentially inflationary, the administration assumes that inflation will actually decline from 2.1% in 2008 to 1.5% in 2009 and then to 1.3% in 2010 and 2011, and not rise above 1.8% through 2019. Well above average growth and incredibly tame inflation? I guess it could happen. But these projections sure look like best case scenarios. The combination of an over-levered consumer and far too much capacity in the system should limit growth a tad, even though we are coming off of a depressed base. Plus, whether you think the US is Japan, Zimbabwe or neither it is hard to argue that a doubling of the Fed’s balance sheet at least does not have the potential to be inflationary. The more I think about it, the more I fear that the projections for GDP and inflation are both too high. Despite all the ramblings about hyperinflation, the more likely scenario may be minimal growth and deflationary pressures, similar to what Japan has experienced. In any case, what nobody wants are government forecasters who are like sell-side analysts who believe that the companies in their coverage universe can prosper despite the fact that the world is falling apart around them. I would much rather see realistic assumptions that take into account the magnitude of the headwinds the US is facing. The ghost of George W. just never goes away. The point is to remember the hand that Obama and his cabinet members were dealt as a result of the choices made by his predecessor. In my eyes these circumstances will never be an excuse for the failure to implement smart policies and reforms. However, an unbiased observer should be willing to give Obama some time and maybe even the benefit of the doubt when the next set of elections comes around. The guys who set the fire are now charged with putting it out: In this piece from Simon Johnson of the Baseline Scenario, he compares Ben Bernanke (who continues to receive accolades for saving the US from a Depression) to some real firefighters who were found to be the original arsonists. The implication, of course, is that Helicopter Ben had a hand in starting this fire, so why in the world are we dumping so much praise on him for helping to protect some of the few remaining buildings from being burned down. It’s kind of like giving a terrorist a medal of honor for disarming a second bomb seconds before it goes off after letting the first one explode. This theme is becoming more and more prevalent among market commentators. People from Taleb to Marc Faber to Simon Johnson are asking the simple question of why we trust our firefighters when they either ignored the fire as it got out of control or actually started it themselves. All of these men have a valid point. Perhaps the most revealing historical dataset in this regard is the one maintained by University of Chicago finance professor Eugene Fama and Dartmouth professor Ken French, which dates back to the mid 1920s. The accompanying table reports the returns of their small-cap growth and large-cap value sectors over the first six months of recent bull markets. To put these historical ratios in context, consider that the corresponding ratio for the recent rally would be 3.2-to-1 if we were to focus on Ford Equity's quality ranking, and 2.32-to-1 if we were to segregate stocks according to market cap. Tough to know exactly what to make of this but it is definitely a cause for concern regarding the sustainability and legitimacy of this rally. Yes, the company has named a new chief executive, who comes from a solid background at MetLife, and yes, he has said that A.I.G. will pay back the government for its bailout sooner rather than later. The giant insurer has been moving to change the names of key business units and working to disentangle its bewildering structure. It even reported a profit in its latest quarter. But none of that really explains the recent gains. Speculation swirls daily that some deal may be in the works, that short sellers are being squeezed out of their positions, or that the company’s former chief executive, Maurice R. Greenberg, may be poised to make a comeback in the role of consultant. The new chief executive, Robert Benmosche, has been fueling some of the interest, as he talks about seeking advice from Mr. Greenberg and slowing the breakup of A.I.G. so it is not a fire sale. [Optique Capital analyst] Mr. Fitzpatrick said he thought the likelier explanation for the increased share price was that speculators looking to profit from a distressed stock had pounced on A.I.G. 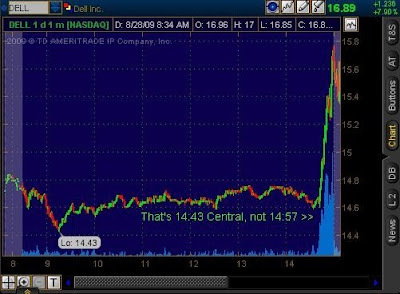 Looks like some run of the mill illegal insider trading in Dell shares: Hat tip to Karl Denninger for posting the chart below. It shows the ramp up in shares of Dell well before the earnings news was officially released around 4pm EST. You can see a big move up in price and a huge spike in volume at 3:43pm EST, a fact that suggests that the news was leaked and those who received the information had no qualms about using it to their advantage. This would never happen if the SEC were still alive. Wait, they are? You're kidding. I wish someone would tell me these things. Well, we know they move REALLY slowly so maybe sometime in 2011 a retail investor trading shares through his E*Trade account will get charged with insider trading. We have no one to blame but ourselves: Hat tip to James Kwak of The Baseline Scenario for posting this link. The authors of this piece from the University of Wisconsin conclude that the US has borrowed itself into a debt crisis. Yes, China may have been a facilitator of our excesses, but the real blame lies in the consumers and government institutions that used leverage to finance consumption and spending. You can also try to blame opaque financial products and greedy bankers but the root cause of our current conundrum is still good ole fashioned excessive leverage. The other thing the authors point out is that this debt fueled consumption not only pushed up the prices of non-tradable goods such as housing, but also of other services for which I think pricing may prove to be somewhat sticky. If I am right, this is a form of inflation that just decreases purchasing power further. The United States has borrowed and spent itself into a foreign debt crisis. Between 2001 and 2007, Americans borrowed trillions of dollars from abroad. The federal government borrowed to finance its budget deficit; private individuals and companies borrowed so they could consume and invest beyond their means. While some spending went for physical commodities, including imports, much of the spending was for local goods and services, especially financial services and real estate. The result was a broad-based, but ultimately unsustainable, economic expansion that drove up the relative price of goods not involved in foreign trade—things like haircuts, taxi rides, and, most important, housing. The key “nontradable” good was housing; that boom eventually became a bubble. And, when that bubble burst, assessments of assets and liabilities across the board became unbalanced. The debt crisis of 2008 would have occurred in the absence of credit default swaps and other exotic financial instruments (such as collateralized debt obligations, the sliced and diced securities based upon other securities backed by mortgages). But these factors greatly magnified the impact of the debt crisis and significantly complicated the policy response to the ensuing events. The Times’s Jack Healy reported the other day that in recent years, some cities and counties that are strapped for money have sold their delinquent tax bills to private firms. The firms, which typically charge double-digit interest rates and steep fees, get to keep what they collect. They also get the right to foreclose on the homes, taking priority over mortgage lenders. Debt collection is always tough. But it is especially fraught when private firms go after unpaid taxes, because private collection distorts the public interest. For example, governments can also foreclose for unpaid taxes, but they are less likely to do so out of concern for property values and quality of life. The auditor in Lucas County, Ohio — which sold more than 3,000 tax liens for $14.7 million — said that the cost to the community from abandoned and foreclosed properties has been greater than the short-term benefit from selling the liens. Mark this as just another subtle, incremental headwind facing the housing market. Unfortunately, I feel like I read about another such impediment just about every day. What still looks cheap to hard-core value investors? Oil major Chevron, pharmaceuticals giant Merck, and contract oil and gas drilling company Patterson-UTI are the only U.S. stocks that passed the most brutal value tests run by analysts at Societe Generale, the investment bank, in London. At the end of February, as the market was nearing its lows, Societe Generale found 44 stocks that passed the tests, including seven in the U.S. So you can keep buying this rally if you want. But don’t be surprised if what you find are not bargains but lemons disguised as good companies. Bob Shiller on the feedback loop of economic confidence: In this piece Yale economist Bob Shiller discusses how both negative and positive confidence in the economy can spread and be self fulfilling. He believes that animal spirits are at work at all times; a view shared by most value investors as well. We know that the pessimism present at the beginning of the year has turned into wild bullishness, but exactly where are we now in terms of confidence? I have been collecting survey data since 1989 on public opinion about the stock market; since 2001, the surveys have been conducted under the auspices of the Yale School of Management. We compute a “Crash Confidence Index,” which measures people’s confidence that there will not be a stock market crash like that of Oct. 28, 1929, or Oct. 19, 1987. The index reached its all-time high in 2006, as the market was still soaring. It reached its low at the beginning of this year. Recently, the Crash Confidence Index has been on an upswing again. Stories about market crashes are less frequent and are being crowded out by a wide variety of other, more normal narratives. The markets have repeatedly been shrugging off bad news because people have a different mind-set. Contrary indicator alert! Investor complacency alert! This is becoming a crowded trade. That might be fine if there were a lot of good news in the short run or news that indicated a brighter future. Maybe there just aren’t many green shoots where I am, but it sure feels like the coming quarters are going to be as difficult for real people as the past 18 months have been. Is John Paulson Seriously Bullish on US Banks?